A paid-entry exhibition about the luxury Italian motor vehicle marque Ferrari started on Friday (January 25) at the City of Dreams Macau casino resort, and runs until June 16. 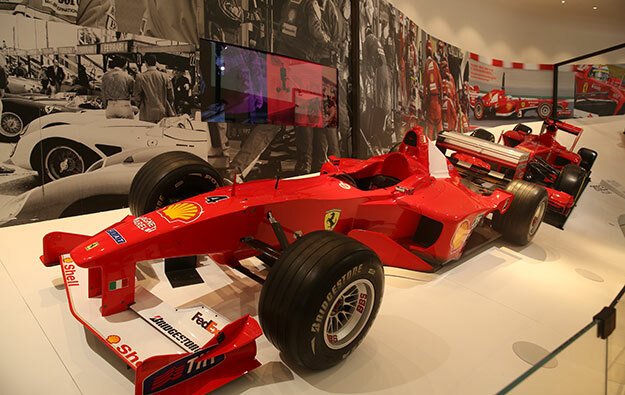 “Ferrari: Under the Skin” features more than 10 cars related to the history of the 70-year-old company – including a Formula 1 car driven by Michael Schumacher for his championship-winning season in the year 2000. The are also approximately 100 other original artefacts. Many are said to be from private collections and are on public display for the first time in Asia. According to a press release issued by Melco Resorts and Entertainment Ltd – the promoter of City of Dreams Macau – the combined value of the items on display is HKD2 billion (US$255 million). The exhibition is said to be a collaboration with the Design Museum, in London, in the United Kingdom, and the Museo Ferrari in Maranello, Italy. Referring to the US$1.1-billion Morpheus hotel tower, an upmarket facility opened at City of Dreams Macau in June, property president David Sisk was quoted in the latest corporate release commenting on the good fit between Melco Resorts and Ferrari. “The collaboration between the two ultra-luxury brands highlights our shared values,” Mr Sisk stated. Cars have been a theme in recent entertainment offers from Melco Resorts. On Wednesday the group launched at its majority-owned Studio City resort on Cotai a car stunt show called Elēkrŏn.